← Potato pizza — anything but bland. We are now proud owners of half a pig. Our friend Don decided to raise pigs this year, and we were able to get in on the results. Our local butcher took care of the dismantling, and very kindly wrapped and labeled every cut. So far, we’ve braised a pork roast and used some sausage in Tom’s chili, both to rave reviews. There’s something to be said for home-grown, organic pork. So far, the meat’s been tender and full-flavored without the slightest bit of gaminess. We tend to focus on tenderloins when it comes to pork, with an occasional foray into chops and bacon, so some of these cuts are challenging. The “pork steaks,” for example, were thick slabs of meat thickly marbled with fat. Normally, the term “steak” would suggest grilling, but with all that fat, a slow braise seemed more in order. My search of the blogosphere for a slow-cooked pork dish revealed an easy pulled pork from Ree Drummond, aka Pioneer Woman. She tosses an onion and some garlic into a food processor with some spices, oil, and vinegar, and purees the whole thing into a flavorful paste. That paste gets massaged into the pork, which is then dropped into a Dutch oven with a little water and allowed to simmer away at low heat until it’s falling to bits. She uses a pork shoulder; I packed together two of those pork steaks because that’s what I’d thawed, and they were marbled enough to survive hours of cooking. I halved the quantities since I was starting with less meat (and it was just the three of us). I also used balsamic vinegar instead of white wine vinegar. I used just a tablespoon of brown sugar; I didn’t want the end result to be too sweet. Because I used thick pork steaks and not a shoulder, I skipped her final browning step — no skin side to brown. I set the meat aside, chilled the sauce, and skimmed off some of the fat. Then I shredded the pork (removing bigger pieces of fat), added the sauce, and reheated very gently. 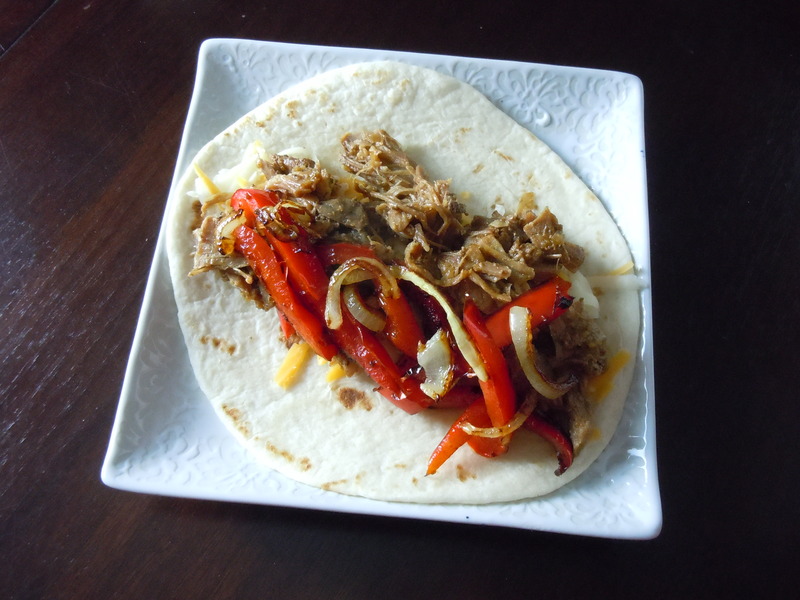 We served the shredded pork on warmed flour tortillas with sauteed onions and red bell peppers, and a handful of extra-sharp white cheddar. The pork is richly flavored but not hot. There’s a hint of the Southwest from the chili powder and cumin, but it doesn’t scream Tex-Mex. 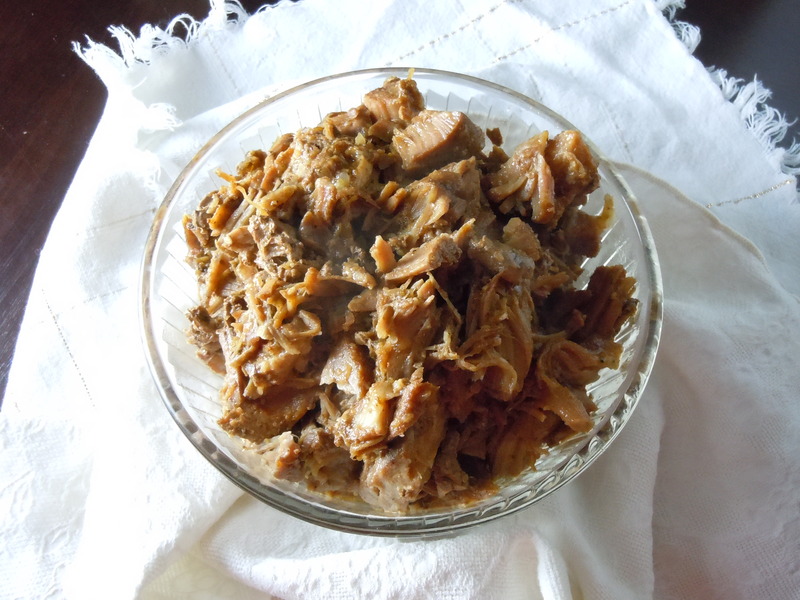 The final recipe provides just enough sauce to perfectly moisten the shredded pork. I removed most of the fat after the pork was cooked, but you don’t need to. We fed tiny bites of the soft pork fat to Cleo and Libby, who were in canine heaven. Heat the oven to 300 degrees F. In a food processor or blender, pulse together the onion, garlic, oil, vinegar, brown sugar, salt, oregano, chili powder, cumin, pepper, and cayenne until it forms a paste. Massage the paste into the pork. Put the pork into a dutch oven or stockpot. Add the water around the sides of the pork. Tightly cover the pot and place in the oven. Cook for roughly 4 hours, turning the pork every hour or so, until the meat is extremely tender. Shred and serve as is, if you can’t wait. For a healthier dish, remove the meat and set aside. Chill the sauce and skim off the fat (or pour the sauce into a fat separator). Remove any fat from the pork, shred the pork, and reheat with the defatted sauce. If there’s a skin side to your piece of pork, drain the sauce and turn up the heat. Brown the pork well, shred the pork, and pour the sauce over the meat. For the tacos, I sauteed a thinly sliced small onion in a few teaspoons of olive oil until golden. I moved the onion to the side, then added a touch more oil to the same pan, then tossed in a thinly sliced red bell pepper. Once the pepper has a few brown spots, add a few tablespoons of white wine or water and a pinch of salt. Continue cooking until the peppers are soft and the liquid has evaporated. Top flour tortillas with the pulled pork, onions, peppers, and some grated white cheddar. This entry was posted in main courses, meat, poultry,and fish and tagged pork, slow-cook, tortillas. Bookmark the permalink.